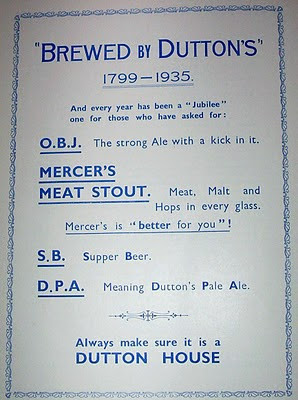 Just to compliment the previous posting, a 1935 advertisement from Dutton's and a Mercer's Stout label. Nothing better than a spoonful of Bovril or similar in your stout, I'll bet. 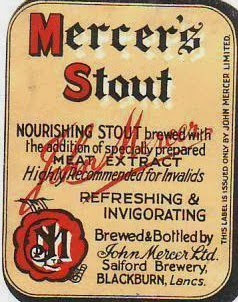 Quite a few of Dutton's pubs advertised Mercer's Meat Stout on their fronts and it was also promoted on their beermats, ashtrays and bottle openers, so it must have been a popular beverage. Mercer's were a small brewery in Adlington, near Chorley, which Dutton's bought out in 1929. The jubilee mentioned in the Dutton's ad, was the silver jubilee of King George V.